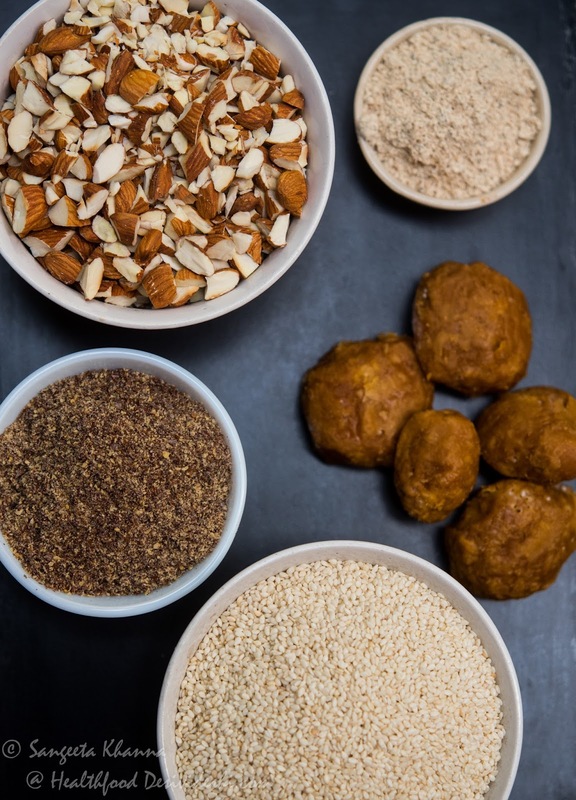 Sesame laddu or til ka laddu is a traditional snack that we have grown up eating every winter. Sesame is great for winters and it is considered warming for the body. This calcium, iron and potassium rich seed is a convenient and cheap way to supplement these minerals. 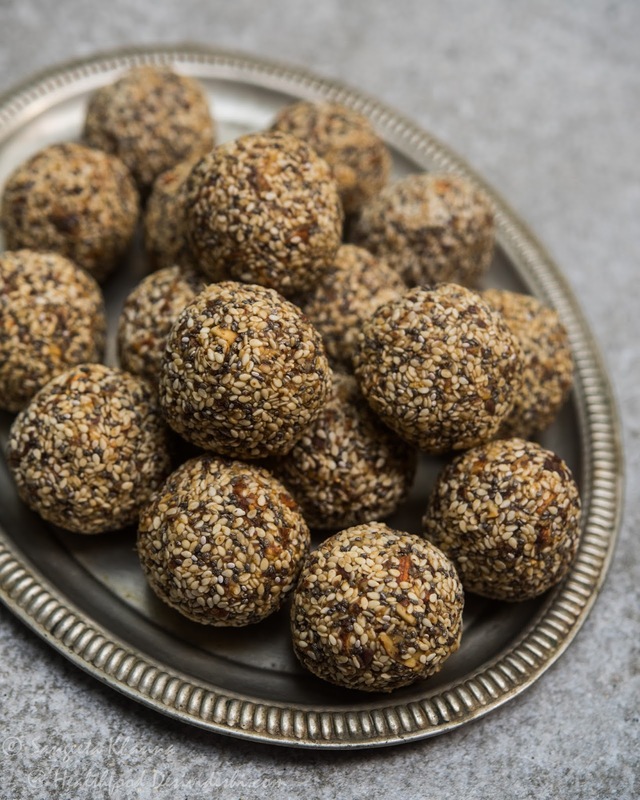 During the last few months I have been having sesame laddus regularly to heal my bones and joints. Initially my finger and wrist joints were so bad I could not even think of making these laddus because working with a ladle and shaping the laddus by using hands was not possible at all. 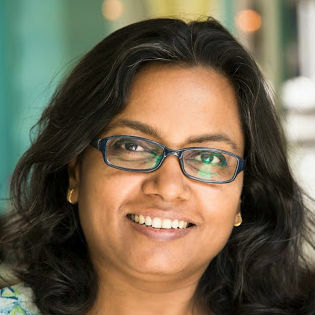 Those early days I depended on the sesame chutney that my house help used to make for us. We consumed insane amount of coconut water to hydrate ourselves during the first month. There was lot of haldi doodh and healing rasam made and consumed that helped me manage the pain better. My doctor advised that the pain and stiffness will stay for the duration it is meant to be but it can be made manageable by healing foods and some physiotherapy. This approach worked actually, even though I was baffled with all the disability it brought along. So as soon as I was able to handle a ladle and a hot kadhai (wok), I made the sesame laddu. This time it was supplemented with a few more seeds and even some grated turmeric along with ginger, some nutmeg and some pepper powder was added to make the healing process faster. It definitely gave me energy as I was feeling completely sapped of all energy for the longest time. To make the process a bit easy on my hands I baked the chopped almonds and sesame seeds in the oven. Spread on a baking tray it took 20 minutes at 180 C. The flax seeds were roasted lightly in a pan before being powdered. Mix all dry ingredients and keep aside. Mix the jaggery and water in a pan and heat till the jaggery melts. Strain the melted jaggery in a large kadhai and place it on the gas stove. Start simmering the jaggery syrup with the grated turmeric and grated ginger if using and keep cooking till it starts frothing and there is a shine in the syrup. You can test it by dropping a little syrup in a bowl full of cold water. If the syrup makes a ball it is ready, if it dissolves it needs some more cooking. Now dunk the dry ingredients together in the kadhai and mix quickly and thoroughly. Let it cool till you can handle the mix. Shape into laddus once cool enough. Grease you hands with ghee to prevent the mix sticking to your palms. If you are in a hurry you can spread the mix on a greased baking tray and press down completely. Let it set and then cut into desired shapes. I realised while shaping the laddus using hot mixture my finger joints relieved a bit as it worked similar to fomentation.Small joints were the worst affected and it was good to see some improvement happening just by making these laddus. I made really large laddus this time to ensure there is lesser work to do and we eat enough seeds mix this way everyday. We have been having the laddu everyday and I have already made 2 large batches since then. I will make a few more batches this winter as I know we can't ignore our health at all. 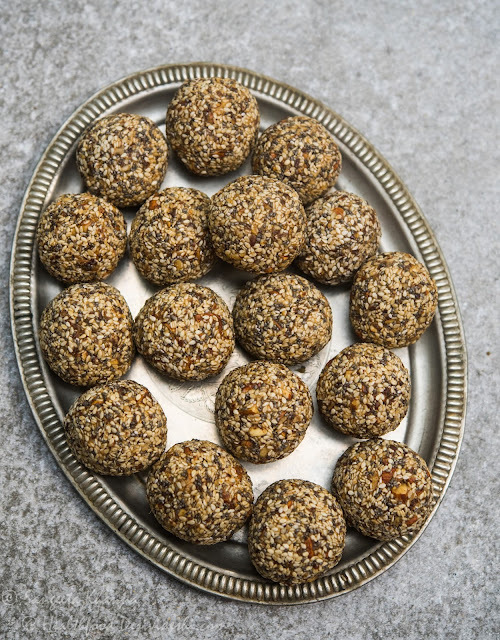 This sesame and mixed nut and seeds laddu actually is a nice protein dense supplement of minerals and omega3s. Make it this winter if you are into heavy workouts or there is some joint discomfort. Consult your doctor to diagnose your condition first, ask if these ingredients are safe and then you can get it made and consume regularly. Prevention is better than cure, but correct diagnosis is a prerequisite to cure and healing. You can use some more chia seeds if you are skipping flax seed powder or just add walnut powder instead of flax seeds powder. I am making this tonight. Never thought of using all these in one laddu though I eat these all in different dishes in a day. Also have some nice gud that Mother in law sent from Gujarat. Can't wait to share pics with you. Xo and feel betetr soon! Can we have these laddoos in summer months also..or there is any alternative for these..
Don't add the ginger powder, nutmeg and turmeric if you are making it for summer.